New York bear hunters took 1,337 black bears during the 2012 hunting seasons, making last year the third highest bear harvest on record in New York, state Department of Environmental Conservation (DEC) Commissioner Joe Martens announced. Only the 2003 harvest (1,864) and 2009 harvest (1,487) surpassed last year's take. "New York has excellent bear habitat and vast, accessible public lands that offer exciting opportunities for bear hunting," said Commissioner Martens. 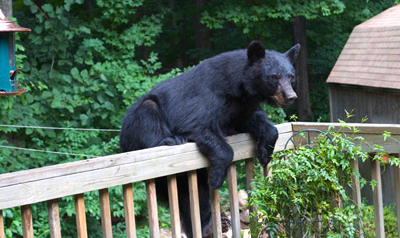 "Black bears are thriving in New York, and they represent a great resource for all New Yorkers. Through the NY's Open for Hunting and Fishing Initiative, Governor Cuomo is improving opportunities for hunting in New York State." Regionally, bear harvest increased in the Adirondacks but decreased in the Southeastern and Central-Western bear hunting areas. Though overall population size plays a large role in harvest totals, annual variations in take are also strongly influenced by environmental factors such as natural food availability and snow fall that affect bear activity and hunting pressure. These environmental influences were very apparent in the harvest totals of the past few years. In the Adirondacks, hunters took 606 bears in 2012, returning to a more normal harvest level after an exceptionally low harvest in 2011. This past season, hunters found greatest success during the early season (386 bears; mid-September until mid-October) compared to the regular season (132 bears; late October to early December). This pattern was expected after a summer of low natural food availability. The early season harvest is always high in such years because bears are moving more in search of food and many are closer to human food sources, which in both cases makes them more vulnerable to harvest. In fact, towns along the western and southern fringe of the Adirondacks saw some of the highest harvests as bears were found feeding in corn fields during the early season. Bears also tend to den early when natural foods are scarce, so fewer bears were available to hunters during the regular season. In the Southeastern bear hunting area, bear take dropped from the record 630 taken in 2011 to 442 taken in 2012. Similarly, take in the Central-Western bear hunting area dropped from the record 353 in 2011 to 289 in 2012. In both areas, take during bow season contributed substantially to the overall take (51 percent Southeastern, 37 percent Central-Western) and increased from 2011, reflecting the longer bow season initiated in 2012 and greater availability of bears during this period. Notably, take during the regular season dropped in both areas. The drop was most pronounced in Southeastern New York where biologists anticipated a potential reduced harvest due to early denning behavior associated with the general lack of soft and hard mast (apples, acorns and beechnuts). Since 2005, DEC has expanded the area open to bear hunting in Southeastern and Central-Western New York and increased season length, aligning bear seasons with deer seasons. These actions were implemented to reduce bear population growth and range expansion. Most recently, in 2011, DEC expanded bear hunting into eastern New York from Rockland and Westchester to Washington counties. Hunters took 22 bears from these newly opened areas, with eight bears coming from each of Washington and Rensselaer counties. Governor Cuomo's Open for Hunting and Fishing Initiative is an effort to improve recreational activities for in-state and out-of-state sportsmen and sportswomen and to boost tourism opportunities throughout the state. This initiative includes the streamlining of hunting and fishing licensing and reducing license fees, improved access for fishing at various sites across the state, stocking as much as 900,000 pounds of fish, expanding fishing clinics and increasing hunting opportunities in various regions. A complete summary of the 2012 bear harvest with breakdown by county, town, and Wildlife Management Unit is available on the DEC website. NYS Black Bear Cooperator Patch Program Hunters play a pivotal role in bear management through reporting their bear harvests. Hunters also are asked to submit a tooth sample from their bear for DEC to determine the age of harvested bears. Typically, for all hunters who reported their harvest and submitted a tooth, DEC issues a NYS Black Bear Cooperator Patch and a letter informing them of their bear's age. DEC is still processing tooth submissions from 2011 and 2012. DEC anticipates that eligible hunters from 2011 and 2012 will receive their patch(es) in late summer 2013.